A recent survey conducted by Meridian Compensation Partners on the usage of stock compensation vehicles found a prevalence for granting multiple types of equity awards to senior executives (although it is most common to grant just one vehicle to lower level employees). In the long term incentive (LTI) section of the 2017 Trends and Development in Executive Compensation, Meridian reported that 90% of the 118 companies surveyed use two or three LTI vehicles for their senior executives. LTI vehicles include performance awards, stock options and restricted stock. 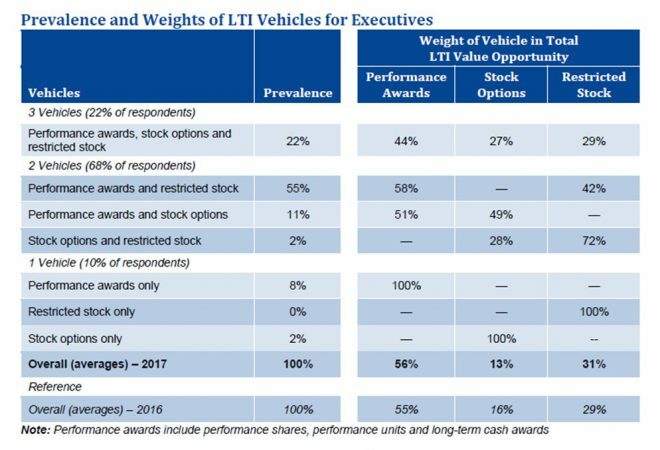 As shown in the table below, performance-based stock/unit awards continue to be the most prevalent LTI vehicle for senior executives. The prevalence column represents the percentage of responding companies that grant a particular mix of LTI vehicles. The percentages listed under each vehicle heading represent the dollar weighting of that vehicle of the total LTI opportunity. Employee stock options are no longer the most popular form of equity granted to executives. Options haven't disappeared, instead they have been joined by restricted stock (shares that vest according to a time based schedule) and performance awards (shares that vest based on company performance). For financial advisors who work with or seek to attract senior corporate executives, multiple grant types represent opportunity. This is because complexity is an advisor's best friend. As company stock compensation plans increase in complexity by including different grant types, executives are more likely to require professional guidance to make decisions. Advisors that can understand the mechanics of sophisticated LTI plans and possess the expertise to analyze, track and model strategies for multiple grant type holdings are well positioned to engage senior executives and help them to make prudent and timely diversification decisions. Start by acquiring and thoroughly reviewing the client's grant documents. Next, enter their company stock and option holdings into a tool such as StockOpter.com to provide them with unique insights such as concentration levels, time value and leverage. Finally, establish annual share diversification and stock option Insight Ratio targets that can be discussed quarterly. Senior executives have a lot on their plates anyway and multiple grants types further complicates matters, so take this trend and make the most of it.